Just got him framed and ready for the Stratford upon Avon Art Society Exhibition next week. WOW, I am in awe of your talent Angela, it is amazing. Well done Angela. You have caught his character so well and he looked great framed. I'm sure he will get lots of admiring looks when hanging on the wall in the exhibition. 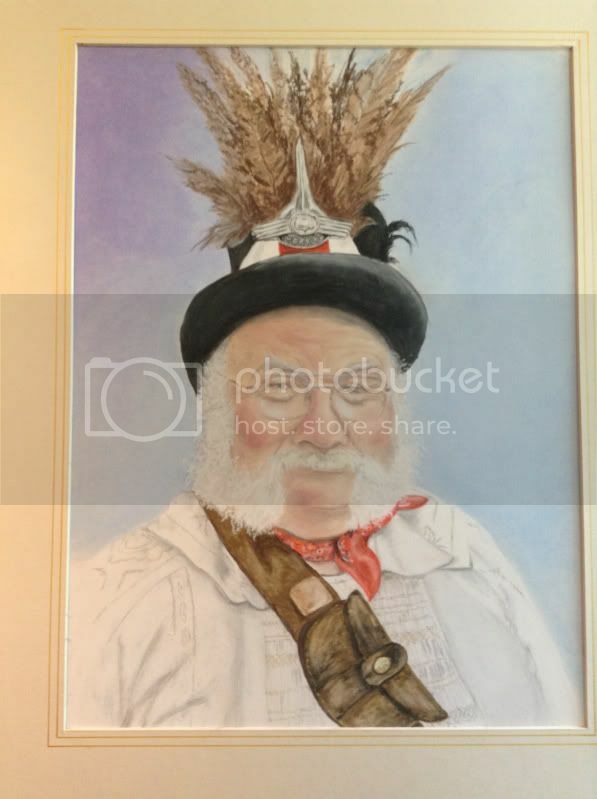 I know a Morris expert would be able to tell just by looking at the smock and headgear (and probably his name plus the position he danced in the side, or the fact that he went round rattling a bag at the crowd). Mo wrote: Who did he dance with? I dunno who he dances with could be Chippong Norton direction. His name is Glen and he plays the fool apparently, I've never met the chap a friend who is in the group took the picture for me.